Everest's Ice and Water Vending machines feature patented technology and expert manufacturing. Everest Ice and Water Systems has partnered with Dallas-based vending machine manufacturer, SandenVendo America. SandenVendo America produces and distributes world-class convenience equipment to serve consumers-on-the-go. 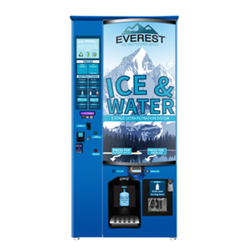 With this new partnership, SandenVendo America will now offer their customers a uniquely designed ice and water vending machine using Everest’s patented dispensing technology. “We've been researching ice vending for a number of years, but we were never really impressed with the technology out there. However when we found Everest, we were blown away by the design,” said Mike Weisser, Vice President of Sales and Marketing at SandenVendo America. With Everest’s VersaVend dispensing system, ice is agitated and dispensed in one single step using gravity rather than mechanical beaters and augers. This patented design eliminates the need for multiple moving parts within the machine since ice is moved and dispensed to the customer with one rotating barrel. Everest’s patented design currently operates in three continents right now, but through this partnership, Everest seeks greater market share in North America. To debut the partnership, SandenVendo America will be exhibiting the Everest Ice and Water vending machine at the NAMA One Show in Las Vegas from April 19 - April 22. About Everest: Everest Ice and Water Vending has patented their VersaVend technology, a revolutionary rotating barrel that both collects and agitates ice, eliminating the need for complicated agitators and auger systems used by the rest of the ice vending industry. While other machines require multiple parts to achieve these functions, Everest’s VersaVend does it all with just one. Include our 24/7 support line and our remote machine manager, and you’ll understand why Everest is the right choice for your Ice and Water Vending business. About SandenVendo America: SandenVendo America, Inc. is celebrating 80 years of vending excellence dating back to the original “Red Top” machine in 1937. Expanding into Food Service equipment in the mid-nineties, Micro Markets in 2014, and now Ice and Water vending distribution, SandenVendo America continues to grow its market share and product lines throughout the world. SandenVendo America, originally The Vendo Company, was purchased by Sanden Holdings in March 2005 and holds various certifications, including ISO9001:2000, ISO14001 and ISO24000.